Football's world governing body is imposing special measures on the venue for this weekend's World Cup qualifier between Liberia and Senegal. The move by Fifa follows the deaths of 10 people before the Lone Star's game against Gambia earlier this month. The Samuel K Doe stadium will be limited to three-quarters capacity on Sunday, and Fifa officials will be in place to check security. Overcrowding has been widely blamed for the deaths on 1 June. Security staff were seen re-selling tickets which had already been used and there were many fake tickets in circulation. Fifa says it will have a stadium security officer and a special observer in place for the game against Senegal this weekend. "The Fifa officers will ensure key points at the stadium are manned with the appropriate number of security forces," a Fifa statement said. The officials will "supervise the ticketing system to ensure tickets correspond to the exact number of seats and are limited to 75 percent of the capacity of the stadium." 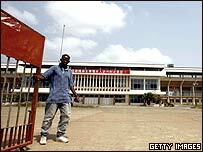 The Liberian government had already said it would introduce numbered tickets which matched seat numbers. Workers at the stadium have been painting numbers on to seats in preparation for the game. Liberia are bottom of group six in combined World and Nations Cup qualifying, with a draw and a defeat so far. This is a sign of lost of Institutional control.......FIFA had to step in. Subtract Game day staff from stadium limit.